Crafted from specially selected jute, bamboo, grasses, and reeds, Zinga’s painstakingly creates a unique window treatment that offers outstanding light control and privacy, while also allowing an unobstructed view when you want it. Perfect for showcasing rooms with warm, natural wood tones, woven wood shades from Zinga’s makes any room special. Unique and intriguing patterns of natural, organic materials combine to make window treatments that, by themselves, will be conversation starters. For a soft, diffused light simply choose a loose weave, while for added room darkening and privacy, select a tighter weave. Either way you can still enjoy the view on your own terms by raising woven wood shades at the gentle tug of your wrist. Woven wood shades can be formal, casual, classic, or exotic. Crafted from renewable bamboo, wood, reeds, and grasses, these shades are both eco-friendly and beautiful. 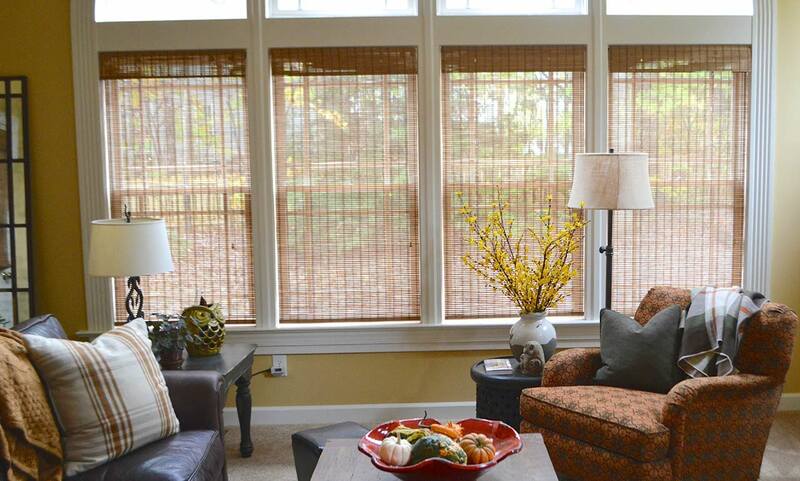 Add the natural touch of the outdoors to your interior living space with our woven wood shades from 3 day blinds. From a rustic, casual vibe, to something more formal and even exotic, woven wood shades from Zinga’s provide versatility by pairing earth-friendly materials with state-of-the-art design technology. The result is a stunning window treatment that fuses nature and the great outdoors with artisan-inspired craftsmanship. Created from extraordinary natural materials such as bamboo, reeds, jute, and a variety of grasses, woven wood shades, also known as bamboo shades and matchstick shades, add both texture and warm tones to almost any living space. In addition to being both durable and virtually maintenance free, woven wood shades offer enhanced light control and are energy efficient since they help to maintain comfortable room temperatures. See how easy and affordable it is to invite the gentle hues of nature into your home with blinds from Zinga’s. Schedule your complimentary in-home design consultation today and discover how Woven Wood Blinds can elevate your home’s decor from the ordinary to the extraordinary!